It was the day after I’d attended Flashback Weekend and I returned to pick up Brian Maze having just checked out of his hotel. Prior to flying in from his native Virginia, Brian had arranged to do a photo shoot with Krystle Street. She’d caught his eye back when she was performing on Dr. Destruction’s Crimson Theatre and Brian was determined to get her as his newest model for Maze Studios (please take the time to “Like” his Facebook page by clicking HERE). Brian had already made a name for himself as an artist (he’s responsible for the Terror Dave faces on our logo as well as having done pogs for our Horror Host Report) but lately has been focusing on his photography. Though Brian had never been up to Kenosha, Wisconsin, he did lots of research on the city and knew exactly what he wanted in terms of locale. I’ve been to Kenosha many times but can honestly say that Brian knew the place much better than I did! The weather was overcast with rain drops falling on occasion but Brian, unfettered, explained this was actually better in terms of pictures. My job (aside from driving him up) was to assist him with his equipment and stay out of the way. Brian and I chat multiple times a week and, while he’s always told me about his shoots, this was a chance for me to see one myself. The last time I’d been in the presence of Krystle was at J.J. Blinkers in Antioch, Illnois (near the Wisconsin border) and joined by the rest of The Crimson Theatre (which at that point also had Deadgar Winters who’s since forged his own show on Wisconsin public access TV) for the 2011 Svengoolie appearance (covered HERE). Back then she was going as “Amy Grindhouse” and I always felt that was her best incarnation. Krystle arrived with her boyfriend and was ready to get to work. I thought she looked amazing with a ’50s pin-up style that suited her quite well. It reminded me of a fellow blogger (Sabrina) who sells home-made vintage style pillows and accessories via “Sabbie Purses” (check her site HERE). Brian told me the shoot could take 3 hours since most models need to warm up a bit but that would not be a concern today. Although a novice, she took right to it and had no trouble taking direction from the get-go. 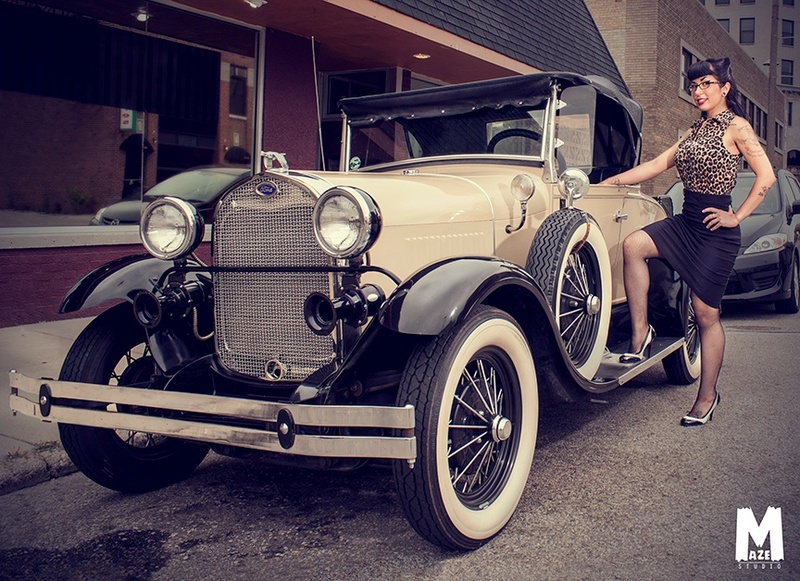 While strolling around to our next setting, we noticed an old, antique car sitting out on the street. Brian asked for permission and was told the owner wouldn’t mind (I noticed the men in Kenosha seemed more than willing to assist) and Krystle was allowed to pose with it. You couldn’t have planned it better as the coloring of the vehicle perfectly matched what she was wearing and, lets face it, there’s always something appealing about the union of attractive women and cars! 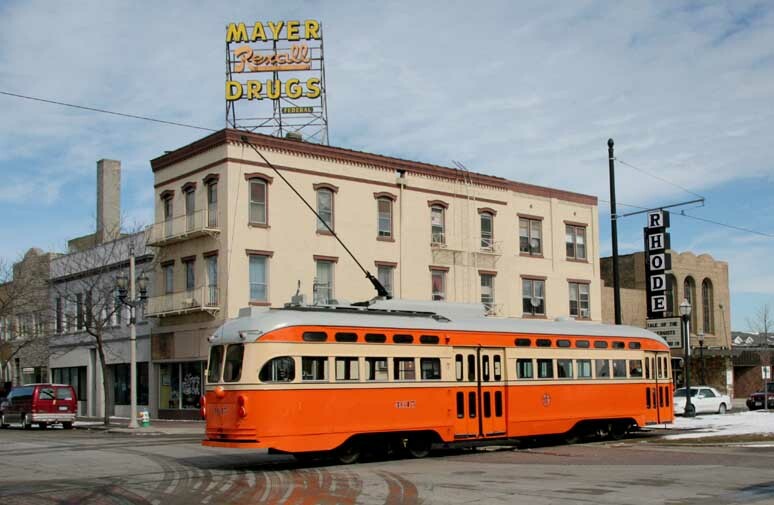 Kenosha has a beautiful area located along Lake Michigan that features great shops, water activities, as well as an old-fashioned streetcar that takes you on a city tour for only $1! Brian already knew this (I sure didn’t) and wanted shots of Krystle during one of its rounds. At one point the streetcar stopped and asked if we wanted in but Brian was busy doing a different shot and told him we’d catch him later. The guy seemed pretty disappointed…like I said the men were eager to help out. We eventually got on board and I sat in towards the front while the others worked with on the shoot in back. At the same time we were riding, a woman was showing Kenosha to a group of visitiors and explaining everything we were seeing (including a cool looking dinosaur museum). I thoroughly enjoyed my impromptu tour and made a note to myself that I’d be bringing my kids up for a weekend vacation next year! I didn’t see Krystle’s shots till recently and, once again, had to give Brian kudos for his research and knowing exactly what he wanted. The shoot ended an hour earlier than expected. All parties had a great time and Brian told Krystle she was a natural! They’re hoping to work together again soon and I’m sure I speak for everyone when I say I’m looking forward to it! This entry was posted in Horror Hosts and tagged Brian Maze, Classic cars, Dr. Destruction, Kenosha, Krystle Street, Maze Studios, Streetcar, Wisconsin. Bookmark the permalink. ← 2013 MASK-FEST: Killer Clowns and Jabbing Jesters!